In my recent review for the latest season of The Big Bang Theory, I wrote about the challenges faced by television show producers as their shows age. Where do you go with the story? Where do you go with the characters? Do you keep giving the audience the same old stuff or do you try something new and different? This was clearly the question which the makers of Homeland asked themselves as the show moved past its second season. And, to their credit, they made a very bold choice with the finale of Season Three, which would take the show in a slightly different direction. But, how would fans react to the new world revealed in Homeland: The Complete Fourth Season? (SPOILER ALERT: In order to discuss the events and themes of Season Four of Homeland, I must divulge things which occurred in previous seasons, so if you haven't been watching on a regular basis, read with caution.) Homeland tells the story of CIA Agent Carrie Mathison (Claire Danes), who has been diagnosed with bipolar disorder and is also sexually compulsive. In the early parts of the series, Carrie was assigned to monitor Nicholas Brody (Damian Lewis), a solider who had been held captive by a Middle Eastern terrorist. Carrie became convinced that Brody was actually a double-agent who had been brain-washed...and she was correct. Also, she begins a torrid affair with Brody, who is married. Brody eventually agrees to work with the CIA, but as Season Three came to a close, he was captured in Iran and executed. As Season Four opens, Carrie is Station Chief in Kabul. She is involved in OK'ing a drone attack which hits a wedding in Pakistan. As the attack hits the news, Carrie is ordered to go to Islamabad to help smooth things over. However, when she arrives at the embassy, she finds that all is not as it should be. Following a tragic event, Carrie is made Station Chief at that location and begins to work on the mystery surrounding the wedding attack. She brings in her old friend Peter Quinn (Rupert Friend) and she consults with her mentor, Saul Berenson (Mandy Patinkin). Carrie begins to suspect that the Pakistani government supports terrorism, which makes her task of apprehending terrorists even more difficult. Carrie goes undercover to help turn a witness to the wedding attack, but this is only the beginning of the operation. As stated above, those behind Homeland clearly realized that the Brody storyline had run its course (especially after those episodes where he was trapped in South America), and they decided to move the show in a new direction. Still, I was very surprised when Brody was killed at the end of Season Three. It almost felt like a series finale, until we got the final scene in which Carrie learned that she'd be going overseas to hold a supervisory position. Thus, the Homeland into which we are thrust at the beginning of Season Four is a decidedly different from the show's previous nature. Sure, many things stay the same, but the overall feel of the series is different. Gone are the days of Homeland being a paranoid thriller. Now, the show feels more like a spy movie which is set in the Middle East. Carrie and Quinn are now involved in spy games in which they must interrogate prisoners, go undercover, and try to outwit and outmaneuver not only the terrorists, but the Pakistani government as well. Sounds pretty exciting, huh? Well, it's not. The show does have some sporadic action, but what we mostly get here is a lot of talking, a lot of politics, and a lot of characters who aren't fully developed. The first few episodes feel incredibly repetitive, as we watch Carrie and the others seemingly doing the same things over and over. Now, this is not to say the season is a complete trainwreck, it's just incredibly inconsistent. For every interesting moment, such as the chase in "Halfway to a Donut" or the sudden death in "From A to B and Back Again", there are episodes which drag along with seemingly nothing interesting or important happening. It's not until the ending of Episode 9, "There's Something Else Going On", that the show truly becomes engaging and is actually "edge of your seat" suspenseful. This is doubly infuriating, as it demonstrates the potential which this show has. From the outset, I've been very vocal about the fact that I feel that Homeland is very over-rated. I found the Carrie-Brody storyline to be tedious and I really hated Brody's family. I actually began to miss the Brodys during the early episodes of Season Four, as it simply wasn't grabbing me. To the show's credit, it truly stepped things up in Episodes 9-11, but then the season ended on a real whimper. So, the popularity of this series still confounds me. The writing is weak, the acting is average at best, and the pacing is questionable. So why do I keep watching? I'm hoping that the series will one day live up to its reputation. Homeland: The Complete Fourth Season has a terrorist who I'm convinced was Rob Zombie on Blu-ray Disc courtesy of 20th Century Fox Home Entertainment. The three-disc set contains all 12 episodes of the show's fourth season. The show has been letterboxed at 1.78:1 and the Disc contains an AVC 1080p HD transfer which runs at an average of 19 Mbps. The image is very sharp and clear, showing no overt grain and no defects from the source materials. The color palette here skews towards dull, but the tones look fine here and the image is never overly dark or bright. The level of detail is good and the image is never soft. The Disc carries a DTS-HD Master Audio 5.1 track which runs at 48 kHz and an average of 4.4 Mbps. The track provides clear dialogue and sound effects. We get some nice stereo effects, especially those which highlight sounds coming from off-screen. The action sequences in Episode 10 sound very good, as the explosions fill the rear channels and bring the subwoofer to life. 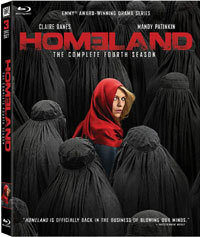 The Homeland: The Complete Fourth Season Blu-ray Disc contains a small assortment of extras, all of which are found on Disc 3. The Disc contains seven DELETED SCENES which run about 11 minutes and come from various episodes. We get three "Character Profiles" (17 minutes) for "Peter Quinn: The Assassin", "Aasar Khan: The Lieutenant-Colonel", and "Fara Sherzai: The Analyst" which features interviews with the actors in question and clips from the show. "From Script To Screen" (23 minutes) features three "making of" segments which focus on three specific aspects of the season and, through interviews with the shows producers, examine the themes and angles of the show.